If I had known when I was in college that “food historian” was a possible profession, my career path might have been different. Alas, I am constrained merely to be an eager audience for the findings of food historians such as Richard Wrangham, whose interesting and persuasive book “Catching Fire: How Cooking Made Us Human” not only presents a strong case for the role of cooked food in human evolution, but also puts the kibosh on contemporary raw-food faddists’ goofy assertion that cooking destroys enzymes in food, and that therefore eating raw food is much more nutritious than eating food that is cooked. Wrangham considers a lot of fascinating issues, such as the amount of time great apes spend masticating their raw food, and the comparative sizes of the intestinal tracts and brains in apes and humans, to make the case that raw food simply cannot supply sufficient nutrition to satisfy the energy requirements of the human brain. The discovery of cooking by early hominids created more easily digested nutrition, which allowed shorter, less-energy-consuming guts and larger, energy-intensive brains to evolve. I have nothing against raw foodists. I find their dietary and nutritional beliefs, devoid as they are of scientific merit (or even common sense), sort of charming, and one would have to admit that their regimen of salads and juices, and more salads and juices, has a certain noble asceticism. 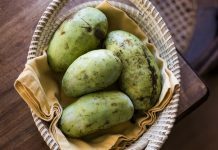 Yet, there is that troublesome issue of sufficient nourishment to the brain…. All snark aside, however, I want to be quick to assert my long-held devotion to one food that I consume raw in as many ways as I can find: the tomato. Locally-grown tomatoes in season are sublime. And local farmers’ willingness to grow such a gorgeously colored and subtly flavored range of new and old varieties should be celebrated even more than I am doing right now. What better summertime snack is there than a warm tomato, sliced and salted and eaten over the sink? 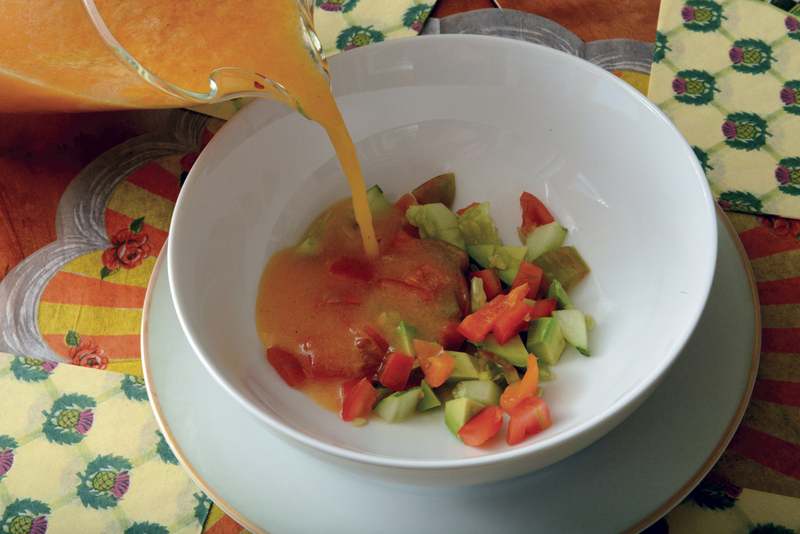 What is more refreshing than a cup of cold gazpacho? The dishes I am going to suggest here hardly need recipes. I seldom make gazpacho exactly the same way twice, the mix of vegetables derived from what is in the fridge that needs to be used up. 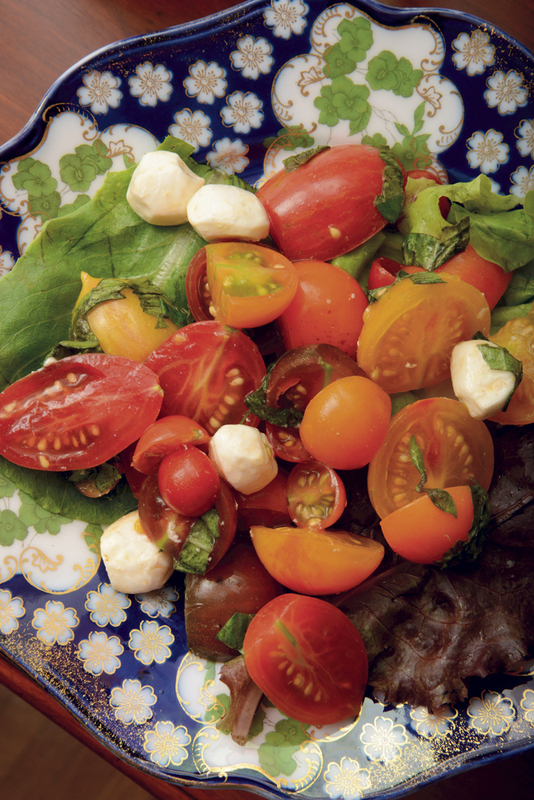 Caprese salads are so simple as to be almost simple-minded, but I want to highlight the superb cherry and salad tomatoes that local farmers have been gifting us with. And spaghetti with fresh tomato sauce is the ideal meal when the temperature and humidity are in the nineties, you are tired and sweaty and you can barely stand the thought of cooking dinner. My everyday lunch gazpacho preference, when I am just making something for myself, is for a chunky soup made with dead-ripe tomatoes, cukes, bell peppers and basil, with a base of tomato juice or, preferably, V-8. But as an impressive start for a dinner party, I turn to this elegant, smooth yellow gazpacho, my version of one I was served at a Barcelona restaurant some years ago. Prepare the vegetables for the soup by peeling, seeding and cutting them into chunks. Push the garlic clove through a garlic press. Mix the garlic pulp into the lemon juice, and stir in the salt. Let the garlic stand in the lemon juice for several minutes, which will temper its harsh bite. Put all the other vegetables in the hopper of a food processor or blender and puree. Add the garlic-lemon juice-salt mixture, and combine well. Pour the soup into a strainer or food mill and force through, discarding any solid pieces or foamy residue. Add vegetable stock to thin out the soup to your preference. Taste and adjust seasonings if necessary. Chill well. To serve, place a small pile of the garnishes, 1 tablespoon or more of each, in the bottom of a soup bowl. Pour the chilled soup into a glass pitcher. At the table, pour a serving of yellow gazpacho into each bowl. Pass additional garnishes if desired. Serves 4 to 6 as a first course. You could sauté the tomatoes and vegetables in olive oil until just barely softened if you want, but then that wouldn’t be a raw sauce, would it? Either way, this and the salad that follows are great ways to use the terrific small tomatoes that I see more and more varieties of at farmers markets. Cook the pasta according to package directions in well-salted boiling water. When al dente, drain well and toss with a little olive oil while you make the sauce. In a bowl, stir together lightly all the vegetables. Add mozzarella, basil and olive oil. Season with salt and pepper to taste and toss to combine. Place warm pasta in a large bowl. Add the tomato sauce. Toss to mix well. 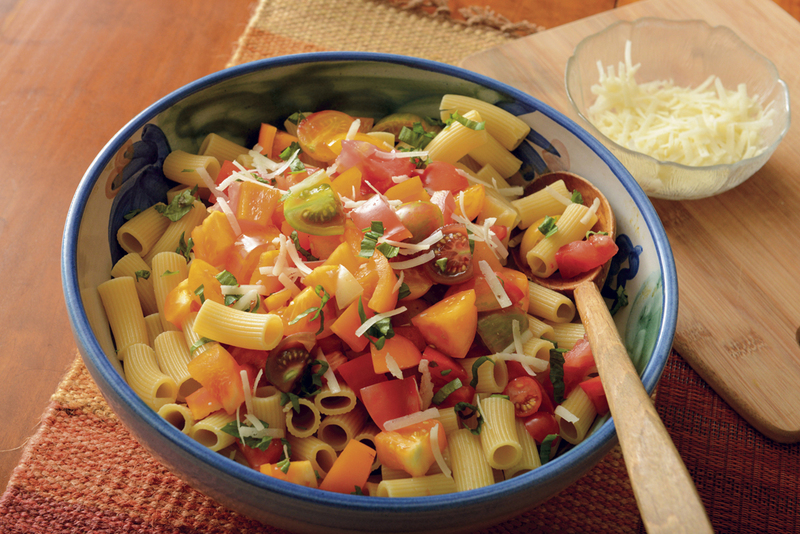 Serve immediately, topped with grated Parmesan. Serves 4. Arrange all ingredients on a plate and lightly dress with Balsamic vinaigrette (recipe below). 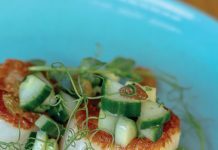 Combine dressing ingredients in a bowl or salad cruet. Whisk well, or shake to combine. Makes about 1/3 cup.